Do Google Website Reviews Matter? In today’s generation, everything you need to know is on Google. Looking for a dentist near you? You Google it. Need to find a restaurant with a gluten-free menu? You Google it. Google has become the initial connector for customers and businesses. Which means that your presence on the internet, and more specifically, your website reviews, matter. 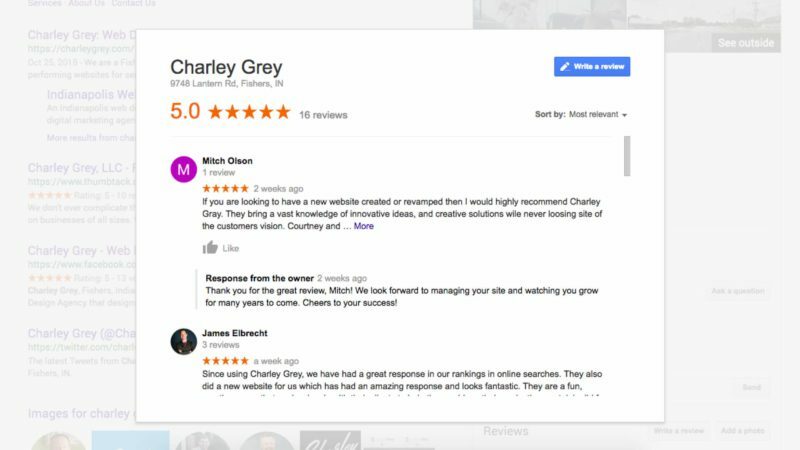 So, if you want a great online presence that sends new customers to your door, your Google reviews is a good place to start. If someone is searching the web, or reading reviews, they most likely already know what they’re looking for. Their decision on whether or not your business fits the mold is almost instant. The first place they look? Your reviews. Studies show that almost 84% of individuals trust website reviews almost as much as they trust personal recommendations. And 68% need to read at least four reviews to develop a trust for that business. Meaning that your reviews really do have an effect on potential customers. With so many other areas of search engine optimization (SEO) to worry about like web design and blogs, Google reviews are put on the back-burner. But they are just as important, especially if you own a local business. In fact, according to a study, Google My Business reviews are the second most impactful influencer when looking at ranking in local searches and map results. Local SEO is directly affected by your reviews in a few ways. Since Google isn’t a person, it relies on your online presence to determine whether your site is worth ranking. To do this, Google looks at links and your website reviews – good and bad. When you get a review this tells Google that your business is real, it’s a good website, and that people are interacting with it. This is great for your local SEO because it helps Google know that your business is the solution to the problem being searched. Again, Google is not a person. When people look at a website they see all the colors, images, and pretty fonts. Google sees text. So, it has to “read” your site to know how relevant and legit your business is. Online reviews give Google more words to read which increases its understanding of your business. This ultimately leads to higher rankings, an increase in site visibility, and added vital content. Website reviews have a strong impact on whether or not the user will go to your website. If you are regularly receiving great reviews, you are more likely to boost your click-through rate. Click-through rates influence your sites SEO by improving your ranking. In short, better reviews lead to more clicks which lead to a higher ranking on Google increasing your sites online presence. And ultimately increasing your business. People value others experiences. Would you rather eat at a restaurant that received two stars or five? Luckily, it isn’t too hard to get those five-star website reviews. Here are five different things you can do to get more reviews for your business. As long as you already have a Google+ page, you can declare your business on Google. Search engines prefer businesses that are verified, so this step is crucial. The information on your Google My Business page should be identical to the information that is on your website. Be sure to add high-quality pictures to your page. Unfortunately, reviews are often completed in light of a negative experience rather than a positive one. Individuals expect good service so don’t often notice when they receive it. What they do notice is when they’re expectations were not met. Therefore, it’s important to ask your customers to leave a review if they had a good experience. Be straightforward with your request! A happy customer wants your business to do well too, especially if it is a local, small business. Here we go again talking about how Google isn’t a person. But, unfortunately, the search engine is not. So, it relies on you to prove that you are and that your business is legit. Aside from that, it’s important for your customers to know that what they have to say matters. Respond to each comment, whether it is positive or negative, in a way that makes the reviewer feel heard. If a user is already on your website it’s safe to assume they are already interested in what you have to offer. That said, use a direct call to action (CTA) on your website. One way to do this is by having a section highlighting some already stellar reviews followed by a button or link that asks the user to leave a review. A great way to encourage reviews is to reward your customers for their time. This could be done with discounts for your services, entrance into a raffle, compensation, etc. Plus, the reward could be used as an incentive for the customer to use your services again. So, you’ve gotten feedback through website reviews. Now what? As highlighted above, it’s important to respond to reviews…particularly the negative ones. Google Alerts can help you stay notified every time your business receives a review. When you do, respond in a way that paints the positives of your business and diffuses any issue. Then take the criticism and apply the necessary changes to your system of operations. What others have to say about you on the internet plays a huge role in the success of your business – both in real life and on the web. Website reviews can affect your local SEO, drive customers to your business, and help your website get more traffic. If you are looking to your grow your business and need help with your website, Charley Grey is a web design agency based out of Fishers, IN. We design, build and manage high-performing websites that rank on the web. All for one crazy-low monthly fee. Sound like something your business needs? Let’s chat over coffee, on us. Call (317) 991-1982.